After hearing about this, I went to my cupboard and found 2 unused packets to check for myself. Sure enough, underneath the ingredients, it reads, “contains wheat, soy” in bold letters. It looks to me like the wheat is in the dried soy sauce they are now using because it reads, “soy sauce (wheat, soybeans, salt)”. I took the time (5 minutes) to call Kraft to find out more. Unfortunately I apparently know more than their customer service reps do. I said that I had heard their dry mixes now contained wheat. 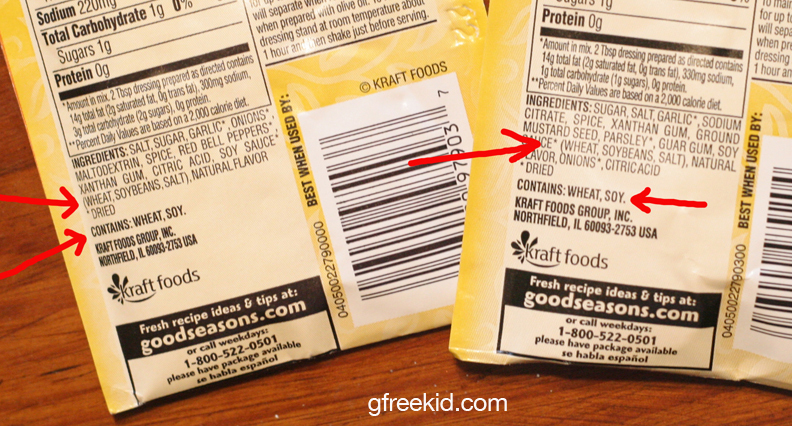 She said that just this month (some people are saying Dec. 2012 but she didn’t know for sure) Kraft reformulated their ingredients and “some of the spices contain wheat.” I notified her that the package said that it’s the soy sauce that contains wheat. Next I asked which dry mixes were involved in the reformulation and she said, “As far as I know, just the Italian.” So I proceeded to tell her that I had 2 packets in my hand (Zesty Italian and Garlic & Herb) which also read, “contains wheat.” That was news to her. So — so far there are 3 mixes affected: Italian, Zesty Italian and Garlic & Herb. I had to ask to get a case number and lodge a complaint (asking them to go back to their old ingredients) and had to give her some coding from the packets. So, please, take a few minutes and join us in calling Kraft at 1-800-522-0501. Ask for a case number and request their old formulation. Maybe there will be power in numbers on this one. Please share this notification so others aren’t inadvertently consuming gluten through these salad dressing mixes. And last but not least, please heed this warning as proof that we all (myself included) need to continuously read and re-read packaging labels and be vigilant for things like this to happen again….even to our tried & true, favorite products. We can never be too careful. This entry was posted in awareness, Uncategorized and tagged good seasonings mixes wheat, good seasonings not gluten-free, kraft gluten, wheat alert by kachalmers2. Bookmark the permalink. I called and complained and got a case number. Be sure to return the new/wheatful packs. Someone who is an ‘official’ with the Celiac groups needs to call them, too. Maddening! Yes, you should be proud of that, April. It was hard for me to admit that I had slacked on reading this one product’s label, but indeed I had….this will teach me not to get too comfortable in the future! I think most of us have made that mistake from time to time. After years of being gf, we get complacent and stop checking labels on our favorite products. Thanks for sharing this! Thanks, Misty. It was hard for me to admit, but I became complacent myself…but not anymore! 🙂 Thanks for stopping by the site. Thank you! This is a product I always keep on hand—and unfortunately had become lazy at reading the label everytime. I called Kraft and the woman I talked to said they have received many phone calls about this. I asked her to lodge another complainnt from me and she was more than willing to do so. Power in numbers! Hopefully we can convince them to change it back! I have been using this for years and stopped reading the label!! my house is completely gf but i use this every week with several meals a week. I have been glutening my daughter for months!!! This is so upsetting! Has anyone found a substitute? I just read this post and I think I found an alternative to the Good Seasons dressing mix. Although I have not yet tried it, I just today discovered Hidden Valley Farmhouse Originals Homestyle Italian dressing and seasoning mix, which is Gluten Free. WOW!!! why change the recipe after all these years, I guess they are seizing the opportunity to make more money,In due time they may bring back the gluten free version and increase on the price. It appear that everything that’s healthy for us seem like the prices become inflated over night, It’s ridiculous that we have to pay so much more for gf foods. I’m still kind of new @ this gf diet, when I was first told that I was gluten intolerant I was told to stay away from wheat products,so Immediately I thought that I need to rid my cabinets of baked goods, hot and cold cereals, flour,corn starch, etc. Never thought that gluten was in so many other foods like can veggies, rice, candy, even some ice creams, never thought about cross contamination, It has really been a learning process, now I don’t just assume, I just read every label. or I check different wed sites. Thank you for sharing, grateful that I found this site. Mystery solved. I made a recipe recently( 1/20/14) that called for a whole packet of Zesty Italian dressing mix. I ate some for dinner. I had terrible stomach cramps and diarrhea the next day. Actually felt crappy that whole week. I told my husband I was so frustrated because I had no idea what I could have eaten that would have caused it. 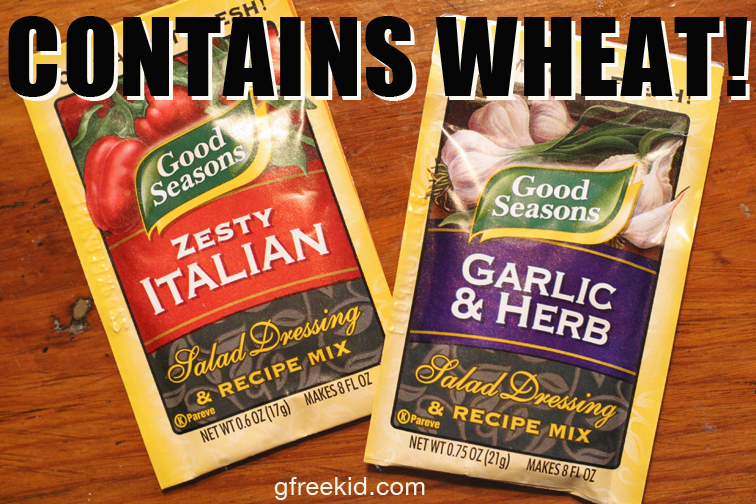 Well, just today I was going to make the same recipe and I got out my Zesty Italian Dressing Mix and just happened to notice it said “contained wheat”. Started googling and found this article. Thank you for posting. I thought I was going crazy because I was positive it was gluten free before. You aren’t crazy…..Kraft is for changing the recipe…..Glad you figured it out, too! It still has wheat in it. Just pulled mine out and threw it away. Frustrating. Thank you so much for posting this info. I just read a GF recipe on another site that called for the Gluten Free Zesty Italian in the recipe. I thought that I had heard something about this so I did some checking before I used the recipe. That’s when I came across your site. Thanks again!!! I just came upon this post while researching Good Seasons Italian’s GF status for a recipe I’d like to try. Do you happen to know if it still contains wheat from the soy sauce? Yes, I recently checked again and they still contain wheat.